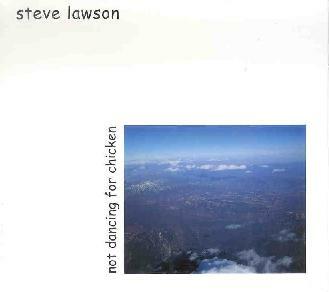 Steve Lawson - "Not Dancing For Chicken"
2002 was a busy and productive year for Bass-meister extraordinaire Steve Lawson. He toured opening for Level 42 and 21st Century Schizoid Band (made up of original King Crimson members), performed at such venues as The Royal Albert and Queen Elizabeth halls, was involved in more collaborations than you can shake at Stick at (errr... Bass I mean), and continued in his role teaching Bass to eager students. And, most important for our purposes here, Steve has a new CD out, his second solo effort since the And Nothing But The Bass CD from 2000 (Though let's not forget last year's collaboration with Jez Carr (See AI #20). For the uninitiated, Steve is a solo Bassist that uses real time looping, recording in real time and then playing over the top, to create beautiful atmospherics and space age jazz influenced tapestries. What's that you say? Solo bass doesn't sound too exciting to you? Well believe me, Lawson is a one man cosmic symphony. There is a LOT happening and if you've got the headphones on (which you should) then sit back and relax as Steve smothers you in caressing layers of aural magic. And there are no keyboards or synths on this album, though you'll be swearing at times that there must be. You'll also be wondering who the guest musicians are but it's really Steve accompanying himself... over... and over... and over. There are 13 tracks on the CD but I'll just touch on a handful of my favorites. "No More Us And Them" opens the set and features killer space atmospherics and multiple melody lines that sing and soar into the heavens. "Mmfsog" is a mucho cosmic jazz-in-space tune in which Lawson seems to pull off a Bass quartet thing. And dig all those cool freaky bits, including the one that sounds like a backwards guitar solo. "Danny And Mo" is an oh so soulful light Bluesy jazz piece. "Channel Surfing" consists of funky soulful space fusion. "Jimmy James" is a soothingly mellow cosmic jazz tune that blends light fusion and Star Trek. And the closing track, "Highway 1", features 10 minutes of space ambient jazz and plenty of freaky alien sounds, making this something of a psychedelic jazz journey. The main difference between Not Dancing For Chicken and And Nothing But The Bass is that the new CD was recorded in the studio. Lawson's music has got to be impressive live, but the studio is definitely the place to record the kind of head tonic that his magic Bass creates, and indeed the proof is in the results. There's music here to appeal to a diverse crowd... from space ambient to jazz fans to prog fans. And I can't imagine any musician who wouldn't appreciate the results of what are actually solo performances. Recommended. For more information you can visit the Steve Lawson web site at: http://www.steve-lawson.co.uk/. Not Dancing For Chicken is distributed by Pillow Mountain Records. You can visit their web site at: http://www.pillowmountainrecords.co.uk. Contact via snail mail c/o Pillow Mountain Records; PO Box 13788; N14 5ER; London, UK.